Be in the Garden of Eden with Adam and Eve as they meet God! Scamper with the animals as they are FREED! from the confines of Noah's ark! Smile as baby Moses is FREED from his basket-boat and certain death! Rejoice with Joseph's FREED brothers and hear of Joseph's generous gift of forgiveness! Journey with the FREED Israelites as they walk - not swim - through the Red Sea! Listen to the dramatized audio Bible stories from creation to the Exodus in FREED! 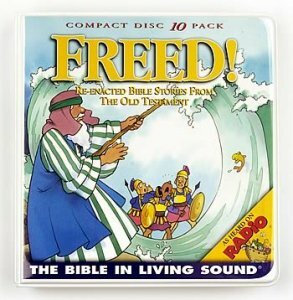 60 dramatized audio stories on 10 CDs in FREED! Use Exploring God's Book 1 workbook as a Bible study guide for personal study, church, Sunday School and home school curriculum for FREED! Volume 1.